From the modern quarters of Gafsa. Gafsa is the main city of its region, and the centre of the profitable phosphate industry. Unlike the towns closer to the mines, Metlaoui and Moulares, it has not been turned into a dust hell. 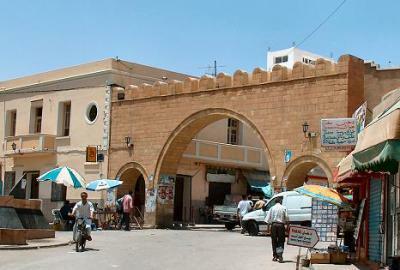 Gafsa is a modern town, busy and friendly, but without many tourists. Those coming here, most often stay only for the night before they head in direction of the mountain oases of Mides and Tamerza, or travel down to the region around Tozeur. But Gafsa certainly warrants a stop in itself. The Roman pools, the kasbah and traditional quarters are all interesting and visually appealing. 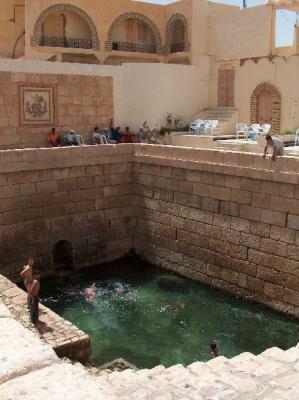 The Roman pools is the only sights of its kind in all of Tunisia. Gafsa has a long history, going back to at least Numidian times. It was destroyed in 107 BCE by the Romans in their campaign against Jugurtha, but would become an important Roman city, reflected in the beauty and size of the pools. The Roman influence was so strong that there are reports of Latin being spoken here as late as the 12th century. Your first stop on a tour of Gafsa will probably be the 5 metre deep roman pools, which are surprisingly well preserved. The water comes from hot water springs, and offer some friendly 30ºC (85ºF). They were constructed for the use of normal people, and this still is the rule. Tourists are charmed by the boys jumping into the water from a roof, diving for coins thrown into one of the pools. If you like to, you can jump in too! 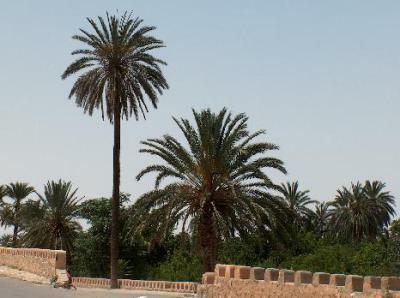 The oasis of Gafsa is about as good as any, although there are few roads leading into. So you will have to swallow a deep breath of courage, and walk into someone's gardens. But as long as you walk on the paths and there aren't too many in the group, nobody will really mind. The whole oasis is fairly big, and has more than 100,000 palm trees, plus a wide variety of other plants.